A yearly initiative for the house, the Adopt a Room program allows individuals and companies to sponsor a guest room. These donations provide much needed funds for the House and it’s programs. Legacy Donors are those who pledge some or all of their estate to the House. They needed a unique way to recognize their generosity on a yearly basis without having a large yearly bill. 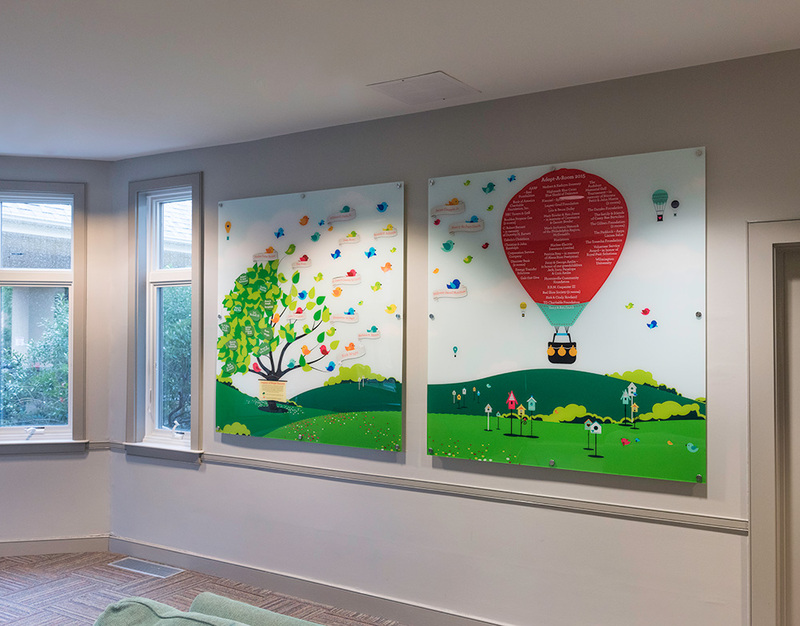 Back in 2014, the Ronald McDonald House of Delaware came to us in need of a two-part design solution: One, create a donor recognition wall for Adopt a Room donors and two, a recognition wall for Legacy Donors. Our solutions would need to be a cohesive unit, yet still recognized as two separate fundraising campaigns. As the content is updated regularly, the client also requested that the solution be easy for them to change with minimal effort. After scouting potential areas for the murals, it was decided that the two murals would live side-by-side in a common room, which is a prominent, high traffic area of the House. One of our main design challenges was to be sensitive to how the legacy donors would be treated after their gifts were realized. It was decided that the legacy donor mural would feature a tree. The tree would have leaves with legacy donor’s names among the branches. After the gifts were realized, the leaf would come off the tree and the donor would be recognized by a bird carrying a banner with the donor’s name. The mural background was printed and back mounted on plexi glass and the donor leaves, birds and banners are printed on a vinyl overlay that can be easily added and removed from the plexi. 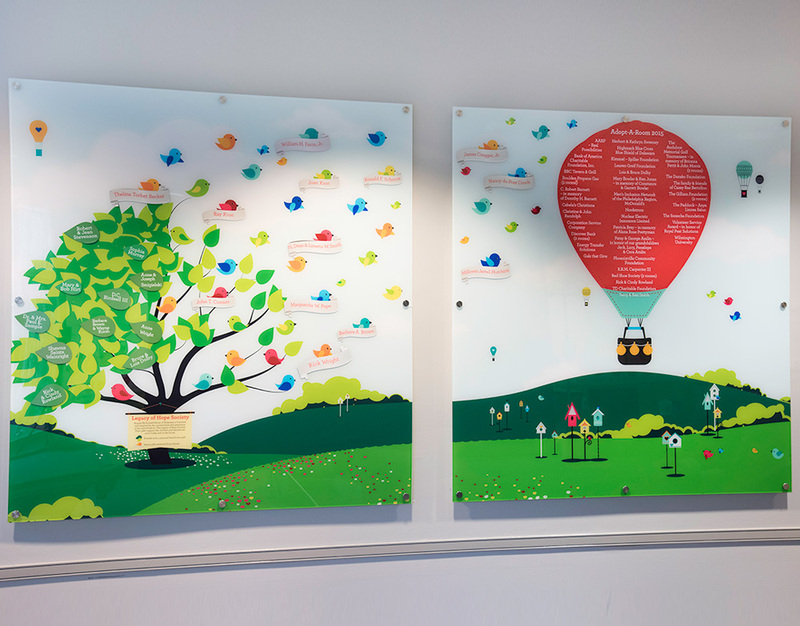 To make the Adopt a Room mural cohesive with the legacy donor mural, we chose a similar illustration style and used bird houses and hot air balloons. The hot air balloon would have a wincos overlay that would have each year’s Adopt a Room donors names. Each year the overlay can be removed and replaced. The bird houses work with the birds on the legacy donor mural, and were also used as room markers outside each guest room. 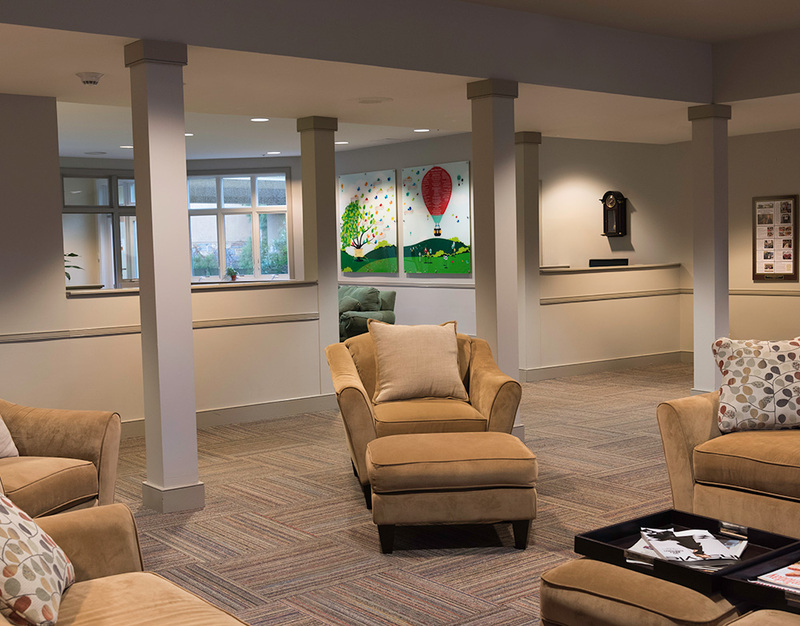 This mural has been updated each year since 2014 with a minimal annual cost and has worked extremely well for the House as a way to recognize and show their gratitude towards their generous donors. The mural continues to be a featured wall in the house.